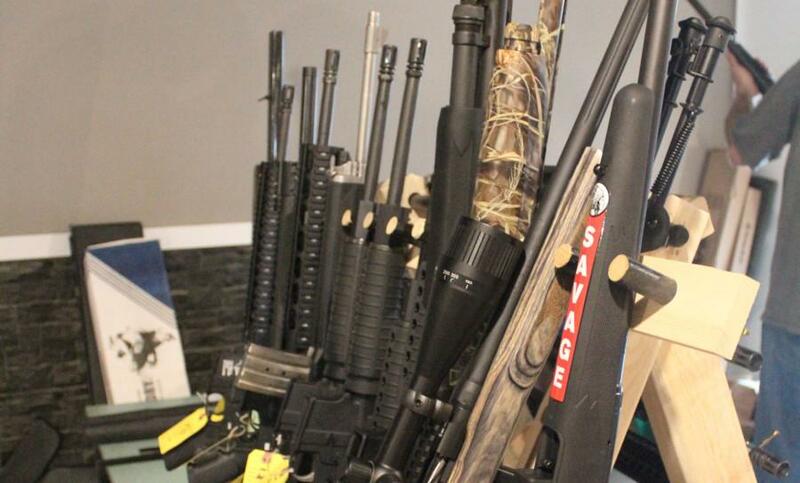 The Schuyler County Shooters Gun Show was held in Rushville, Illinois on Saturday. While a gun show may seem intimidating for someone without much experience, the salesmen were eager to talk about their merchandise and explain the different functions to beginners. Firearm salesmen from all over the state gathered to display their merchandise for onlookers to not admire, but to potentially purchase. For Justin Oliver and Jon Taylor, the Schuyler County Shooters Gun Show was their first show. Their table displayed mainly concealed carry weapons such as small frame revolvers, semi-automatic pistols and more. From 8-4 p.m., families, hunters, collectors and enthusiasts had the opportunity to look at the displays in the Wright Event Center after paying a $3 general admission fee. Tables lined along the first wall displayed ammunition for a variety of firearms. Wrapping along the rest of the walls, tables exhibited rifles, shotguns, pistols and other firearms except for two tables set up next to each other: one for kids to practice shooting at a target with an airsoft gun and another set up as a bake sale by some of the wives. Two very large square displays were set in the center of the room displaying even more firearms, accessories and literature. People could be heard haggling prices. Another salesmen, Bob Northrop, found an interest in firearms from rural Illinois’ favorite pastime: hunting. All federal, state and local firearm laws and ordinances are to be obeyed at the gun shows. No person is allowed to handle a firearm without first showing their FOID (Firearm Owners Identification) card. GunShowTrader.com, a website that announces local gun shows, also provides a list of basic tips to help beginners know the proper etiquette while in attendance. The list of 101 tips includes things such as respecting firearms, showing up early, looking at the entire show before purchasing, not touching any merchandise without the dealer’s permission and much more. Gun shows aren’t just for the hobbyists and hunters though, they can also be a family affair, as they are for the Prochazka family. He, as well as his father, grandfather and son all share the same name: Adolph Prochazka.